Academie Science and the approaching 'portal'. This is the introductory page to the new section which looks at the science on a phenomenon this work understands was written of in ancient texts. You will see from the brief extract from a lecture below by the late Stephen Hawking, that Black Holes contain information, just as an Artificial Intelligence system does, but when there is an overload of information, a Black Hole is formed. This work has the understanding provided from ancient texts, that a fault was created in this galaxy in the ancient past when planets which existed before this planet became inhabited, explored the energies of the lower EMF spectrum. Any world using this energy is 'fallen' simply because it has embraced and become part of that lower energy. It is this lower, more magnetic energy which makes the development of Technology possible including AI - artificial intelligence - which the texts appear to indicate developed in such a way that it began to 'mimic God'. We now know that 'God' refers to the Living Life Energy Systems which produce the Life Streams for eternally living suns, planets and people (described elsewhere). It is surmised that with the creation of the first Technology and AI, and in the process of when that was first done, that in this galaxy the first Black Hole was inadvertently created, which then began to expand and bring other living matter into its 'event horizon'. That is why this planet and the section of the galaxy it belongs to (not this solar system) which were all once part of the much larger Andromeda Galaxy, were separated from the parent galaxy. This planet has itself been targeted to align directly into an approaching entry point into the Black Hole on this side of the centre of the galaxy. That people would be persuaded to help make that alignment possible takes place through the influencing of consciousness and the 'temptations' of 'gifts' and pleasures. Contrary to what the expectations were for entering this 'entry point' for previous planets and previous versions of the cycle of this planet, it did not prove to be a step 'closer to god' or a step up in 'evolution'. It was described as the goddess Kali, as the Gorgon, in Norse myth its energy was the 'black poison', and it was the end of each of those worlds. That does not mean the planet itself was caught in it, and information is that this planet is not yet caught in this 'invisible force'. This current crossing of the phenomenon which is expected to soon appear from behind the sun, is considered a dissolution followed by a repeating 'new Earth' which is currently still on the 'Cycle of Rebirth' phase. However, eventually, there is expected to be a Grand Dissolution called the Maha Pralaya. This work surmises that this - the connection into a black hole which proved not to be 'as above so below' - is what the ancient texts were warning about. Reference: How soon will we see the black hole at the Milky Way’s heart? | EarthSky.org *sent to us by Erika.
. - An international consortium has been striving to obtain an image of the “shadow” of the event horizon of our Milky Way's central super-massive black hole. ..........astronomers’ recent efforts – aimed at our galaxy’s heart – have provided insights. This week (January 21, 2019), they reported that, for the first time........ global network of radio telescopes to learn that the emission from Sgr A*....(the Black Hole). "Science wishes to Explore the Entry Point into the Black Hole which this Planet is Soon to Encounter". So, what is this Black Hole and using high profile Stephen Hawking as an example of scientific viewpoint, what did he have to say about it? "A black hole has a boundary, called the event horizon. It is where gravity is just strong enough to drag light back, and prevent it escaping. Because nothing can travel faster than light, everything else will get dragged back also. Falling through the event horizon, is a bit like going over Niagara Falls in a canoe. If you are above the falls, you can get away if you paddle fast enough, but once you are over the edge, you are lost. There's no way back. As you get nearer the falls, the current gets faster. This means it pulls harder on the front of the canoe, than the back. there's a danger that the canoe will be pulled apart. 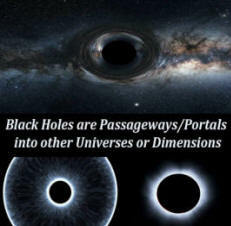 It is the same with black holes. If you fall towards a black hole feet first, gravity will pull harder on your feet than your head, because they are nearer the black hole. The result is, you will be stretched out longwise, and squashed in sideways.. If the black hole has a mass of a few times our sun, you would be torn apart, and made into spaghetti, before you reached the horizon. However, if you fell into a much larger black hole, with a mass of a million times the sun, you would reach the horizon without difficulty. So, if you want to explore the inside of a black hole, choose a big one. There is a black hole of about a million solar masses, at the center of our Milky Way galaxy. Although you wouldn't notice anything particular as you fell into a black hole, someone watching you from a distance, would never see you cross the event horizon. Instead, you would appear to slow down, and hover just outside. You would get dimmer and dimmer, and redder and redder, until you were effectively lost from sight. As far as the outside world is concerned, you would be lost for ever.........one can't tell from the outside what is inside a black hole, apart from its mass and rotation. This means that a black hole contains a lot of information that is hidden from the outside world. But there's a limit to the amount of information one can pack into a region of space.....So if there's too much information in a region of space, it will collapse into a black hole, and the size of the black hole will reflect the amount of information. It is like piling more and more books into a library. Eventually, the shelves will give way, and the library will collapse into a black hole." Additional notes. (From 'go highbrow'.) "The Milky Way is comprised of two parts: a disk and a halo. Most of the stars in the disk are relatively young and were likely formed in the Milky Way itself. The stars in the halo, on the other hand, are much older, more ancient stars. Most scientists believe that these ancient halo stars were formed in neighboring systems or galaxies but were sucked into the Milky Way due to its larger gravitational pull." (*Andromeda is currently edging towards the Milky Way however, it is believed that that is only to retrieve the aspects of that body which were pulled into the Milky Way).